Monday night I experienced a first. 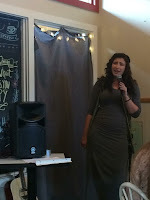 I attended my first poetry slam. And while I've been to several poetry readings, I've never been to a slam. What's the difference, you ask? Well, a slam is a competition between poets that have memorized up to a 3 minute long poem, who then perform it. I say perform because vocal inflection and presentation and style all count in the scoring. The closest thing I can compare it to is The Moth which is people getting up and telling a story of up to 5 minutes in length. The audience votes on it and the high scores advance. The event was held at Mama D's, a coffee shop in Genesee Depot. It consisted of 7 poets competing in 3 different rounds. Each round eliminated a number of people, based on scoring from 3 judges. The first round had seven competitors, the second reduced it to four, and the third round was the best two of the four. Now, a little aside. I almost signed up for a spot, not really knowing what the requirements were. I'd heard that you didn't need to memorize your work, and I even brought 3 poems. When asked if I wanted to read, I said I would if there was enough time. But after the first poem, I knew that I DID NOT want to get up there. By the third person, I'd concluded that I will probably never perform in a poetry slam. None of this is to say I didn't enjoy it, because I really did. The poems were compelling and most were very well performed. However, it was my first exposure to snapping by audience members as a sign of appreciation when a particular part was well liked. I'd always heard people talk about it, but didn't think it was a real thing. Well, it's a thing. Of course, with me being Mr. Self Conscious and probably one of the oldest guys there, I didn't snap at all, despite liking many parts of many of the works. I spend way too much time worrying what people are going to think. I consider this a weakness, but it's also part of my DNA. The winner of the whole deal was a guy from the Twin Cities who was a poetry Jedi master. He went up against a very talented young female poet who was a close second finisher. In the end he nailed a very long poem about words. It was a fantastic finish to a very fun evening. So, despite feeling impossibly old amongst the backdrop of a much younger, hip crowd, I would definitely go to another one. Heck, I may even snap. This is great Jim! I discovered slam a long time ago... about 2007 and it's been a part of my larger poetry community since then. In fact, it's what got me back to writing. I too discovered slam was not something I had a knack for, but I tried it, competed for a year or so, and then stuck with page poetics :). Performing is hard work! I definitely admire slam poets for all they put into their poems.